AccuQuilt has published a blog post today with instructions for my machine embroidery Fun Flower design that is quilted in the hoop. I hope you will head over there and read it. I had a lot of fun making this quilt and can see more quilting in the hoop in my future. Last week AccuQuilt published a blog post that I wrote about creating a trapunto effect with machine embroidery. What makes it so easy and fun to do is that the AccuQuilt GO! die cutter was used to cut the batting shapes for “stuffing” the trapunto. What an easy method for trapunto. A full tutorial can be found on the Accuquilt blog. And here’s a link to the Butterfly Beauties Machine Embroidery set. I love this set because there are both traditional and contemporary embellishment designs. It is one of my favorites embroidery sets–and stuffing the butterflies as in this quilt just adds to their beauty. I had always made these butterflies in softer colors in the past, but absolutely love these bright colors. The dimension on the trapunto never shows as well in photos as it does in reality, but here are some photos. I am cross posting this Valentine tutorial from the AccuQuilt blog. You can find the full post by clicking the image. I had so much fun working on these cute machine embroidery ITH Quick Kids Bears from Dolls and Daydreams and adding my Candy Hearts Machine Embroidery to make them Valentine bears. Can’t wait until the grandchildren can come visit and make some too. Today Darlene at QuiltShopGal has done the first part of a tutorial on how to use this machine embroidery design set to create a fabric book. Her method uses felt to make the book. It is a much simpler and better method than the way that I have made other fabric books. This is going to be my new go-to method. With nine grandchildren around here, we have quite a few fabric books, and it always amazes me that the older children (the oldest is age 8) love them as much as the little ones. And I love them because they are indestructible and washable. Here’s a picture of all the blocks in a wall hanging. Hope you can join the stitch along–these are really fun designs and can be used not only as the wall hanging, but as a table runner, placemat, fabric book, and more. It won’t be long until Christmas, and I have been working on some Christmasy embroidery and table runner quilts that will be gifts for my daughters and others. This is such a quick and easy one to do. The embroidery is quick and the table quilt is even quicker. You will find instructions for doing the embroidery at the AccuQuilt blog today. And for the table runner quilt, the instructions are below and there’s a pdf printout that you can download too. I also included some closeups of the embroidery. You will find the design set over at the AccuQuilt website here. Stabilizer – see Notes about stabilizer selection in Embroidery Instructions that come with the Machine Embroidery designs. Setting Triangles Cut 4 each 6-7/8 inch squares. Each of these squares will be cut in half diagonally from corner to corner. Corner Triangles Cut 1 each 7-1/4 inch square. This square will be cut into quarters by cutting diagonally from corner to corner (see diagram). Borders and Binding: Cut 7 each 2-1/2 inch strips across the width of fabric. For top and bottom borders, cut 2 each strips 29-1/2 x 2-1/2 inches. Use remainder of 2-1/2 inch strips to make double fold binding. Background Squares for Machine Embroidery Cut 9 each 8-10 inches square. These will be cut to 6-1/2 inch squares after the embroidery is finished. Coordinating Fabric for Applique Shapes Select fabric that coordinates with the Quilt Fabric to be used for applique shapes. NOTE: Complete instructions for cutting die shapes is included with the dies, on the AccuQuilt website, and in the Machine Embroidery Instructions. Assemble rows as shown in diagram. When rows are complete, stitch rows together to complete the center square. When rows have been stitched into center square, add borders by stitching side borders first, then stitch top borders across. Layer quilt top, batting and backing and complete the quilting of your table quilt. When quilting is complete, trim away excess batting and backing and finish your quilt by binding it with double fold binding. I feel like the White Rabbit in Alice in Wonderland–late, late, late for a very important date. 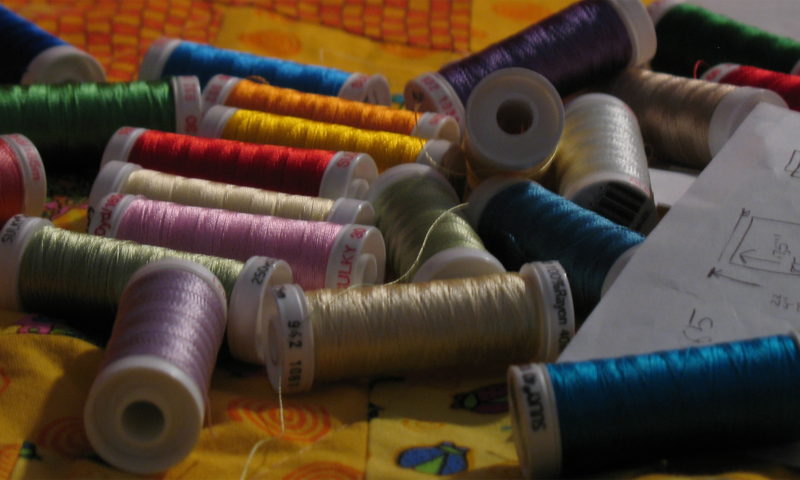 Quilting seemed to interfere with my plans to have a totally unrushed and calm holiday season. Part of the problem is that I just couldn’t say no when people asked me to help them finish their quilts. However, as of yesterday, the packages are shipped, and I can settle down to things like baking cookies and decorating the tree. Tomorrow–Monday–we’re going to have a great Blog Tour with lots of recipes. SewCalGal has organized this group of stitching cooks, and I think you’ll find some fun recipes. Here’s a list of all the participants. To celebrate, I did a little stitching to accessorize my daughter who always does a lot of baking. 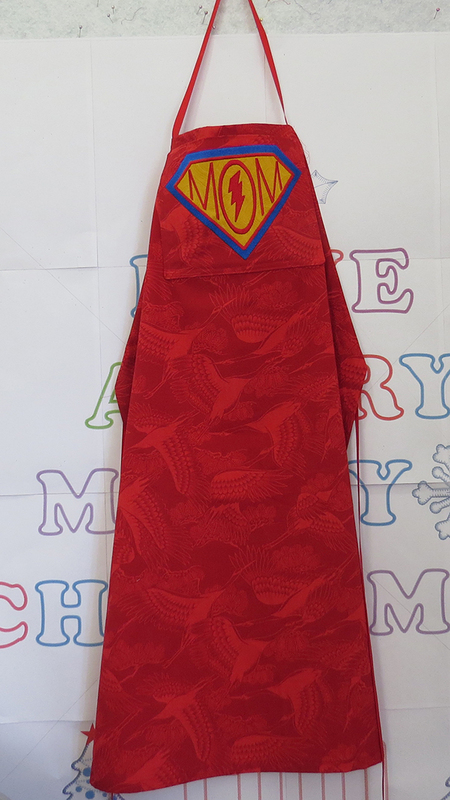 The recipient of this apron has three boys and is expecting a fourth any day now. She keeps the boys in line and runs a tight ship. She definitely is a Super Mom. 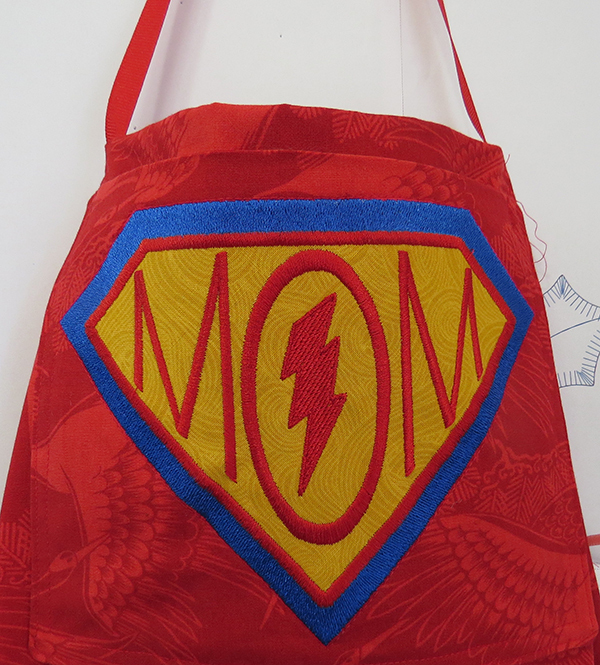 And since those boys are into Superheroes, I thought they should know that Mom fits into that category too. I digitized this embroidery myself using Art and Stitch software. It was a great experience for me as I learned to manipulate the letters using the various handles that allow one to reshape and respace letters in a lot of different ways. This was the first time I felt that I really could create text the way I wanted it. And if you want to create something like this, but don’t have the inclination to do the digitizing, Embroidery Library has some great designs for all kinds of stitchers with super powers.